Can I get your recipe for that? No. Sometimes. Usually, no. Well, sorry, there’s usually not a recipe for the stuff I cook. But there is a technique. Don’t get me wrong, learning all those techniques requires patience and dedication. It’s a lot of work. But once you have the technique, the rest is easy. Or, I should say, for some people it’s easy. The flavor pairing part can be hard sometimes. That’s why you need the good book. I’m not talking about the Bible, proper. 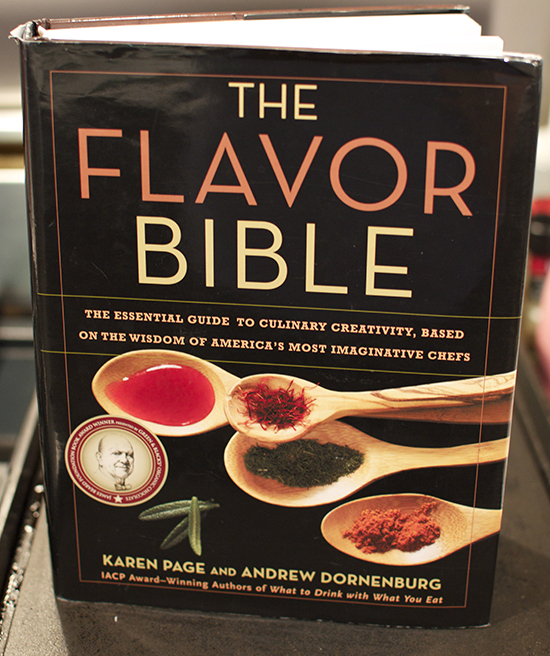 I’m talking about The Flavor Bible by Karen Page and Andrew Dornenburg. On first glance, it’s a big glossary. And I suppose that’s what it is on any longer look as well. But, it’s like, the best glossary ever, okay? The Flavor Bible is a book for pairing. Not for pairing wine or beer to food (they have another book for that, What to Drink with What you Eat), but for pairing different foods to each other. So if you’re trying to make a substitution and you’re stuck, grab that bible. If you don’t have the first clue what to put with that crazy new item in the crop share box this week, grab the bible. A lot of people go to cookbooks for inspiration, and I love a good cookbook, but when it’s time to do the real, dirty work of recipe creation, The Flavor Bible is really the only book I need. So brush up on your technique, and study your bible. Congratulations to Holland Falls, winner of the RS&C Facebook page launch contest! She’ll be receiving her copy of The Flavor Bible this week. If you don’t have a copy on your bookshelf, I highly recommend fixing that problem. Happy cooking, everyone!